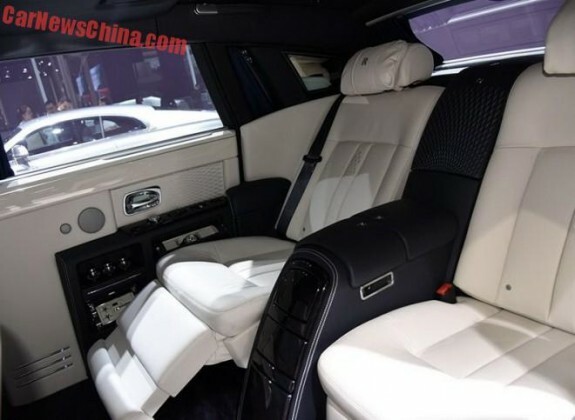 At this year's Shanghai motor show, Rolls-Royce Motor Cars is launching the eagerly anticipated Asian debut of its Wraith "Inspired by Film" as well as the global premiere of its Phantom Limelight Collection. The stunning showcase represents a new standard of authentic, bespoke luxury motoring for Chinese customers. "We remain committed to serving China's successful business entrepreneurs and elites, among whom our exclusive super-luxury motor cars and bespoke personalization program continue to grow in popularity," said Torsten Mueller-Oetvoes, chief executive of Rolls-Royce Motor Cars. "Rolls-Royce Motor Cars possesses a strong artistic heritage, which helps fuel our drive to continuously provide better products and services for our customers in China," he said. "Wraith 'Inspired by Film' - which makes its Asian debut today - and the global premiere of Phantom Limelight are a testament to the creativity and personalized detail that come together to make the most compelling super-luxury cars in the world. "The new themes and elements of customization in these two luxury bespoke collections, along with our recent Inside Rolls-Royce Brand Exhibition here in Shanghai, inspire and invite our discerning customers in to personalize these hand-built works of art according to their own unique tastes." The Wraith "Inspired by Film" celebrates Rolls-Royce's long heritage in movies and its entry into the British Film Institute National Archive - the world's most significant collection of film and TV history. Continuing its earlier theme of "And the World Stood Still", this Wraith is a true hero's car, hinting at film noir through a number of unique bespoke touches. Life imitates art as the silver screen is reflected through a unique two-tone silver and jubilee silver paint scheme, while a solid-silver hand-cast Spirit of Ecstasy plays the femme fatale to the leading man, as he follows in her wake on an unexpected adventure each time he takes the wheel. Wraith's coach doors open to reveal the hero's interior life, which proves more colorful than its exterior would suggest. The anthracite-toned leather interior accented with casden tan exudes confidence and power like a modern superhero's costume, while its steely character is suggested by a pin sharp aluminum band shooting through the Maccassar ebony open pore paneling. A powerful twin turbo V12 is more than enough to back up the bespoke Wraith's dramatic exterior styling - and can take the driver from zero to 96 km/h in just 4.4 seconds. Expected to leave motor enthusiasts at the show breathless, the Phantom Limelight Collection's deliberately understated exterior projects a subtle stealth-like quality. The Limelight Collection draws upon Rolls-Royce's illustrious heritage of fulfilling the every need of discerning customers by offering a modern day interpretation of luxury, comfort and personalization - unsurpassed by anyone else. Nowhere is the sensation of luxurious comfort more pronounced than in the Phantom Limelight's interior rear seating, which features exclusive functional innovations to help a gentleman or lady neatly store their accessories. Extended rear door panniers, pockets and an accessory Z-box hold and conceal watches, fragrances, jewelry and more, while ensuring they are on hand for any occasion. A diamond motif design punctuates the Phantom Limelight's seashell coach line and is contrasted by a rich navy blue coach line, creating a sensation of floating in the ultimate privacy and comfort of this mobile palace. The experience inside the Phantom Limelight is one of utter opulence, enticing passengers with a haven of calm in which to prepare, relax and bask in the limelight of a truly luxuriant lifestyle. 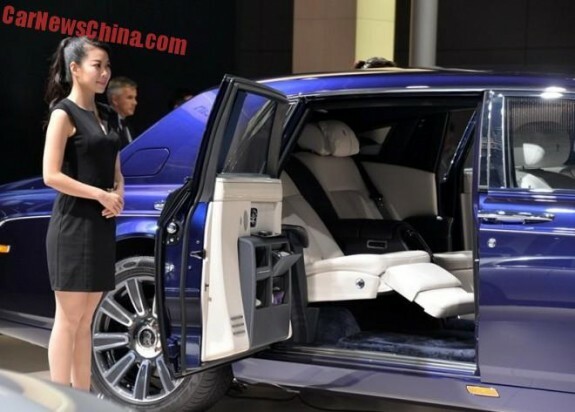 Preceding the Shanghai motor show, Rolls-Royce thrilled motor enthusiasts in Shanghai with its first ever Inside Rolls-Royce interactive public exhibition, allowing visitors to experience a multi-sensory journey through the company's world-renowned engineering, design and craftsmanship. 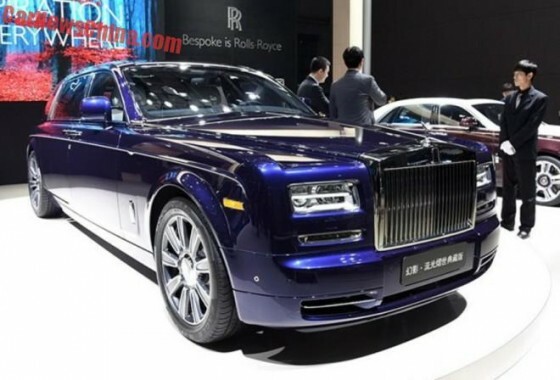 The exhibition, together with the new models showcased at Auto Shanghai 2015, provide an unprecedented insight into the remarkable lengths required to create the world's pinnacle super-luxury motor car, setting the stage for another successful year for Rolls-Royce Motor Cars.